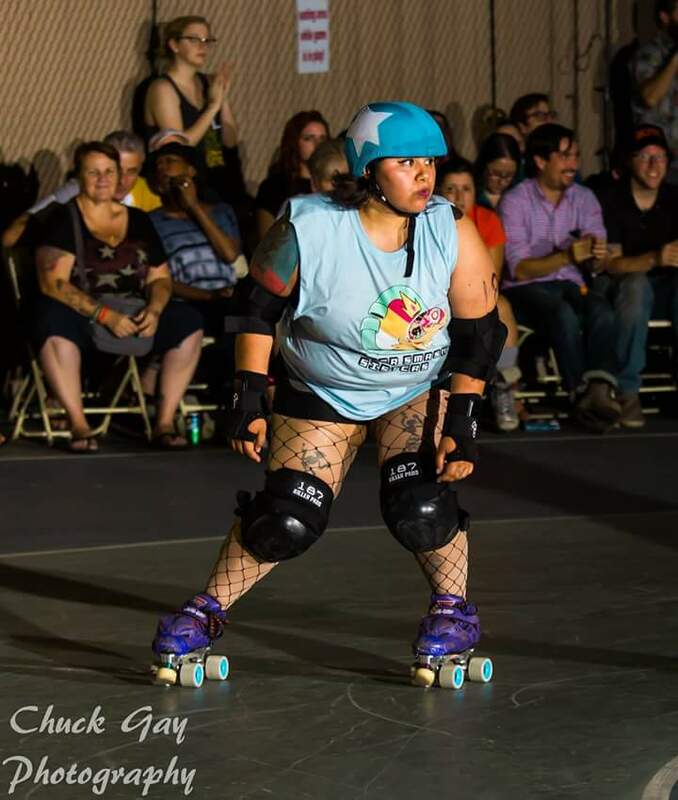 How did you get started as a roller derby official? I started about 2 or 3 months after I joined the league. I wanted to learn more about derby and this is a great way to see the game from another angle. I have been NSOing about 1 year and a half. Who inspires you, both on and off the track? My family inspires me to be better skater and NSO. I think derby helps me be a better wife/mom because I can let out my frustrations on the track. Novakaine inspires me, because she always gives it her all and is super encouraging and friendly to everyone. What's something you wish all skaters knew or realized? Like wine, skaters get better with time. If you constantly show up and work for it, you'll get there eventually. Never give up. Like ever! When not derby-ing I'm usually hanging out with my family and our dog Slash. How did you decide on your derby name? It's kind of a mash-up of my nickname and my favorite musicians. My nickname is "Killer", then my favorite artists are Jim Morrison from The Doors and Freddie Mercury from Queen. Jim Morrison was known as the "Lizard King" but to make it fair to Mr. Mercury, it became Lizard Queen. How did you get started as an official? After I started derby, the trainers mentioned that NSOing would help us understand the sport. Honestly, it has helped me out very much in understanding gameplay and rules. Something you wished skaters knew or realized? Roller derby is not easy. You must be patient as hell to understand both the skills and the rules! Be open minded! I decided to start officiating to learn the sport as a whole. I didn't have much roller derby knowledge before joining the league and it seemed like the perfect way to learn. I started to dabble in the NSOing my first few months and dove into reffing immediately after that, thanks to the help and encouragement of the Ref Neck crew. Inspiration comes in waves to me. One day it's my family, the next it could be an OMG, a ref, or even a trainer/coach. I've probably found inspiration from just about every leaguemate. I see you, putting in work. I'm sure skaters realize reffin' ain't easy. However, I want to encourage more people to come on out to try it. It's fun and the best seat in the house. When I'm not on the track I'm working REALLY far away. So my time with my family and my derby sisters is really valuable to me. How did you decide on your derby name? What does it mean to you? I chose Stockholm Syndi, derived from Stockholm Syndrome, because my favorite Disney movie is Beauty and the Beast. Over time, the name became more fitting. In essence, I joined a sport that's rough on my mind, body, and soul, but here I am, still rollin' and still in love almost four and half years later. Plus, the first occurrence of Stockholm Syndrome happened in 1973 during a 6-day bank heist from August 23 to August 28. August 23 just so happens to be my birthday! I started officiating derby around two years ago, first starting as an NSO and then moving into on skates reffing at scrimmages. Officiating helped me to become a smarter skater, to learn the rules better, and it helps my league out. We all know how short-handed we are on officials — especially being one of many leagues in Southern California! My boyfriend-slash-bigger half, Refael. He inspires me to be a stronger skater, smarter referee, and an all-around decent person. I always ask him all kinds of rules questions whether we're at practice, driving around, or at dinner. He's always there for his fellow officials, whether it's for help at another game or giving them tips on how to become better at what they do. Plus, he doesn’t give me a break when I’m playing. He calls me on most, if not all, of my penalties! What's something you wish all skaters realized? In the end, officials are human beings who deserve respect, even if you don't agree with them. And we need them to keep playing this sport. It’s no secret that my “personalities” [gestures to my chest] are large. For a while, I was embarrassed by my twins, Olga and Holga. But as I got older I felt empowered to embrace all of me, even if they create a few back issues. I knew I wanted to join the derby community, but I didn’t really know about officiating. A light bulb went off as I began to learn the rules. There’s a lot to learn and analyze, but I am very much up to the challenge. I’m going to have to say my lovely cousin, HardLee Ann Angel. She has taken on a lot of responsibilities recently, within the league and in her personal life, and she basically just grabs life by the horns and takes it for a ride. What's your spirit animal? Why? What's something you wish all skaters knew? Reffing is difficult. As officials, we need to see everybody’s movements and then determine the legality of it all, which comes from understanding the rule set. Now, I’m not saying that I want everyone to ref, but it would definitely be nice if all skaters took some time to read the rules. What’s the best part of being an official? I make it a point to be at scrimmages with freshly-cleared skaters. You get to see the gears turn as they start putting together what they learned in training and begin to apply it to gameplay. Yes, there are a lot of penalties, but a few weeks down the road you see an almost unrecognizable skater. They give all of themselves on the track. That makes me want be a better official. You can find me singing as a part of the West Coast Singers, hanging out with family, or just snuggling up at home with my boxer, Ginger. How did you get started as a roller derby referee? I got started in Roller Derby because my girlfriend (PrisKilla Presley) started playing and convinced me to help out NSO for a bit, then I started reffing. It's been about 2.5 years since I started helping out with the league and I haven’t looked back since. I have always enjoyed movie monsters and monsters in general. Something about being a misunderstood monster is incredibly appealing to me. My current spirit animal is Guillermo Del Toro. He is so unapologetic about his love for creatures, horror, and the art of story telling that I can't help but hope to be like that when I get older. What's your favorite roller derby memory? My favorite Roller Derby memory has to be Roller Con 2015. It was my first year going to Roller Con and honestly it was the most overwhelming experience. I had never seen such intense high level Roller Derby played before and it was amazing. Not to mention it was really awesome to be with a community of like-minded people watching derby, playing derby, and learning together. What's your advice to Freshies? You are going to fall, no matter what. So just get it over with and get back up. It's something I really struggled with when I started skating, the idea that falling is not necessarily a bad thing. It's no easy task getting knocked down and then getting back up again, but just do it. Stay motivated. I'm kind of obsessed with Teenage Mutant Ninja Turtles if you haven't guessed (although Michaelangelo is my favorite). 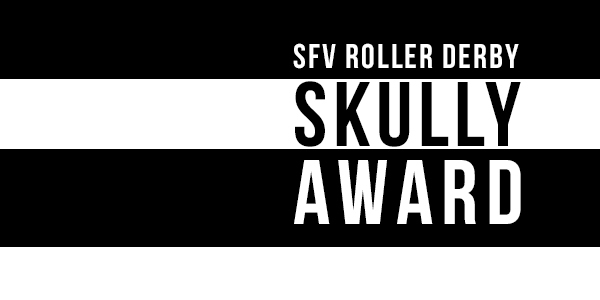 I started about six months after my girlfriend, Stockholm Syndi, started at SFV Roller Derby. I frequently came to practices and after seeing how much she really enjoyed it, I finally decided to get involved. Three years later and I'm in love with this game, my leagues, and the community! My favorite derby memory happened at the Big O 2015. I was in the back row near turn 3 and noticed Victorian Roller Derby League gathered behind us. I attempted to sneak a selfie with them, but they noticed and immediately started posing. I've met so many people in this community that I look up to that I have the opportunity to call friends -- great players and officials that have great qualities that I hope I can translate into my own experiences. Off the track, my best friends inspire me. As much as we all party and goof off together, we're all bettering ourselves and continuing our educations on our way to being healthcare professionals, engineers, musicians, and more. I wish skaters knew how far out-of-play they skate to chase jammers! And that being an official is hard. Skating refs may not see everything, but we try our best. If I’m not at SFV, you can find me practicing with the Drive-By City Rollers, or else driving an ambulance, in class finishing my prerequisites for nursing, or spending the rest of my days with Stockholm Syndi.